Jim Byrd, a conservative political contributor for Examiner.com, published an article on January 30, 2012 that satisfied my political apprehension for the day. Mr. Byrd very eloquently reminded readers that sometimes it is better to fight liberalism with unrelenting humor and hyperbole than to try to fight fire with fire. In the case of Debbie Wasserman Shultz–just generally, I am often left either speechless or loud-spoken when watching her network news interviews. I either clench my fists and cry a little inside or rant and rave at the television with no affect but to annoy my girlfriend. Jim, I really enjoyed your article. Sometimes a little sarcasm and good-natured humor is the only way to keep from going crazy. As I imagine many of your readers similarly experience, I cannot keep my teeth from grinding, my fists from clenching, and my stoic indifference at bay when watching a Debbie Wasserman Shultz interview–talking points and all. I usually end up yelling some objection at the television in protest–to no effect but to annoy my girlfriend. Thank you for prescribing the remedy: good ol’ fashioned hyperbole. On the eve of what is going to be one of the upcoming 2012 Presidential Race likely to be plagued by accusatory and negative political rhetorical from all political perspectives, I often wonder how certain Congressmen and Women get away with, if not untrue, certainly contrived and deceitful talking points. One particular Congresswomen sticks out in my mind as a habitual violator of what one would consider trustworthy politicking. 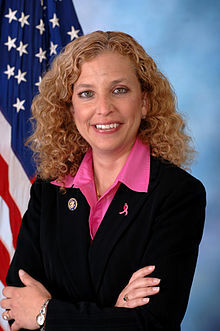 That would of course be Debbie Wasserman Schultz, the U.S. Representative for Florida’s 20th congressional district, serving since 2005 and the Democratic National Committee Chairwomen. She is the congressional cheerleader for Democratic policies, liberal and humanitarian Utopianism (see Mark Levin’s “Ameritopia”), and most prominently Presidential Incumbent, Barack Obama.